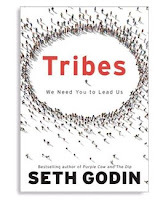 "Tribes: We Need You to Lead Us" is an easy read from Seth Godin that presents the case for why You should be leading. Everybody can inspire a tribe towards collective action, regardless of where they sit in an organisation, and this book challenges you to step up, lead and challenge the status quo. There are some great snippets of information throughout, and I agree with most of what he is suggesting re Leadership, although there is also a hate message re Management that I think is a bit too strong. It is a good book for motivation and whilst not prescriptive in how to lead provides some good pearls of wisdom for leading in the digital age.